Discussion in 'Mark Blount's Port Cellar: Celtics Forum' started by Devizier, Feb 4, 2019. ... because it is more efficient. Would you please provide the board with your definition of "better"? And to whom? Thank you. This reminds me of when I lived in the former USSR, and people would tell me things like "Russia is 2nd most beautiful language, is scientific fact from research." The game today is amazing imo, but using trendline graphs of turnover % to "prove" that is...let's just say I enjoy Monday morning humor. My basic premise is this: in a given game, you want as much time as possible dedicated to active play. In essence that means field goal attempts, and to a lesser extent passing, setting screens, etc. Scoring helps but even misses are exciting so long as the ball remains in play. What you don’t want is stoppages. Obviously using turnovers and free throws is a proxy for those but they are a reasonable approximation from top line box score numbers. Today’s game is essentially a steady improvement, beginning with the merger, in reducing the types of things that lead to stops in play. The fact that this improvement has been so steady, even through the dark ages of the 90s, is remarkable. The league has also done a good job (imo) making the last 2 minutes flow better. I was watching a college game recently, and it was utterly brutal in comparison. As an example, the end of the OKC game yesterday maintained tension incredibly well, even as the Celtics were being fouled and OKC was calling timeouts to advance the ball. The main factor right now though, imo, is that the talent levels in the league are insanely high, and star players are really balanced out. If the league hadn't f-d up the cap when Durant went to GSW, we'd be talking about 8-9 teams as legitimate championship contenders, which is incredible. The league is better when there is space - when people can show what they can do athletically and aren't being bludgeoned every time that they have the ball. The early 1980s, the league was great - well, at least the team I watched - because there were always at least three and probably four or five guys on the court who could score, which means that the ball-side heavy defenses that are prevalent now wouldn't have worked very well. The current NBA has created space by getting people to realize that teams taking 28 feet jumpers will beat teams taking 15 feet jumpers provided the 28 foot jumpers are made in sufficient percentages. The only thing to which I object is that the games sometime turn into 3P shooting contests but the today's game is way better than the late 1990s/early 2000s. As a side note, I also think the pro game is way better than college these days and am shocked when people disagree. Yeah, for anyone who likes the product, as opposed to rooting for laundry and randomness, NBA is clearly superior imo. That wasn't true 15 years ago when the NBA's product was bad, talent levels were lower, and there were fewer one-and-dones in college. Well, as I like to say, maybe the 75 best college basketball players are playing in the NBA each year. It's kind of too bad too because instead so many of these guys who would be playing in big time, meaningful games are either not playing at all or are playing in meaningless games just so they can finish off their rookie contracts as soon as possible. edit: I'm not saying that these guys should stay in college are make millions for the TV networks and their universities just selfishly speaking, watching guys like JT and JB (just to name 2) in the NCAA tournament was what made it great in the "old days." 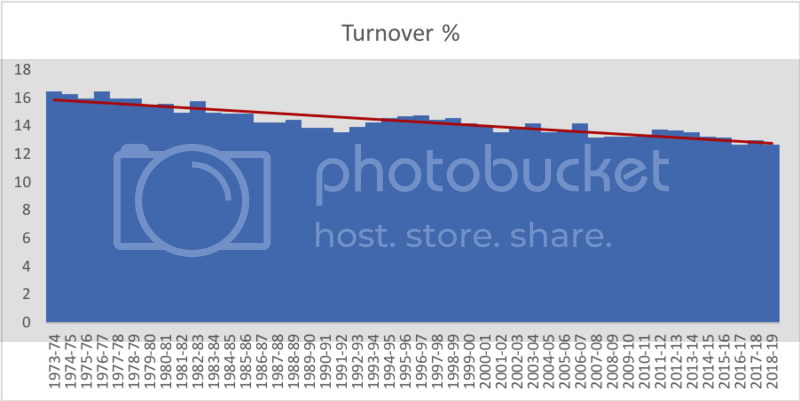 I don't think turnover percent is a good proxy. Turnovers are created by good defense just as often as by bad offense, they frequently don't result in a play stoppage from the ball going out of bounds, they're exciting, etc. And even if they do stop the clock, it's not for a timeout or long period of relative inaction (as FTs are), it's a quick side-out or end-out usually. The decline in turnover percent speaks to better fundamentals and talent level, but has nothing to do with watchability. You want to improve the watchability of the last 2 minutes of close games, start calling intentional tactical fouls for what they are - intentional fouls. Fouled team gets 2 shots and the ball back. No more incentive to try and turn 2 minutes into 20 real minutes by fouling 10 times. If a team is ahead by 5, and you can't stop them by playing honest defense and hoping to get a turnover, then you lose. If it's close enough and you're playing honest defense and a foul happens, well, whatever, same deal as now, hit your free throws - but running and bear-hugging a player in an obvious intentional foul should be called an intentional foul. I would much rather watch honest defense and gameplay, even if it means that teams that are down by 2-3 possessions in the closing moments no longer have the longshot of "let's foul and maybe they'll miss a few". Hasn't this been argued a thousand times? The argument could just as easily go back the other way... hit your free throws. I know guys like Shaq had trouble, but it does make teams have to think about who they put out there. And isn't there something about not being able to foul off the ball in the last two minutes? Or am I imagining that? This article seems to say that some of what you're suggesting has been put in place.. were these rules not put in place? I don't know what to tell you man, we watch the same games. 5-point game with 50 seconds left, the leading team inbounds the ball and the trailing team chases after them and bear-hugs them. Clearly an intentional foul. The announcers, the players and everyone watching all know that it's a foul to preserve time, and get some scant hope of being able to hit a few 3s and catch up. They'll do it 3 or 4 times and either draw closer, or they'll miss some of their 3s and give up and let the clock run out. This happens in the 60% of games that are close at the end. Changing the away-from-ball foul rule barely made a difference. You just foul the guy with the ball, maybe after a few seconds of seeing if he'll panic and throw it away. I don't pay to watch a free-throw contest. They're a necessary evil to disincentivize intentional fouling of a shooter. Players "have to make their free throws" the rest of the game, too. But there is a rule on the books about intentional fouls. They should be called as intentional fouls. There's no reason that every close game should get endlessly drawn out by a bunch of intentional fouling and free throws. For every 1 game where it makes "drama" by letting the trailing team get to within one possession and try to tie it up, there are 20 where it's a mindless, even hopeless, slog. Go back to the old "3-to-make-2" if its an intentional foul late in the game. That won't prevent teams tactically fouling, in the hopes that they get a few more possessions in the last minute to try and tie it up. It just decreases the odds that it will be successful, rather than eliminating them entirely. In fact, that's the worst of both worlds: same herky-jerky monotonous ending to the games, but with much-decreased chance of seeing a dramatic last-minute comeback (which is the payoff in the first place). If a team fouls intentionally, any basket they score on their next possession only counts two points. It would make games much less interesting, but it would stop the intentional fouls. I don't pay to watch a free-throw contest. They're a necessary evil to disincentivize intentional fouling of a shooter. Players "have to make their free throws" the rest of the game, too. But there is a rule on the books about intentional fouls. They should be called as intentional fouls. There's no reason that every close game should get endlessly drawn out by a bunch of intentional fouling and free throws. Maybe I'm missing it, but other than away-from-the-ball fouls or before an inbounds pass, I can't find anything about non-flagrant "intentional fouls" in the run of play in the NBA rules. It's in the comments on the rules, but one of the criteria for what constitutes a flagrant foul is “Whether or not the player was making a legitimate basketball play (e.g., whether a player is making a legitimate effort to block a shot”. Read strictly, that might preclude fouls that are clearly to stop the clock rather than legitimate efforts at a steal/block/some other basketball play. But it's a multi-pronged set of criteria, so that's not an obviously correct reading. 1) After any foul deemed to be intentional, automatically credit two points to the fouled team and give the ball to the fouling team under its own basket. So effectively, take the foul shots themselves out of the equation: if the foul is clear and intentional, they are assumed to be made. (This could work across the entire game to eliminate the Hack-a-Shaq strategy throughout the game as well.) So either you have to play legitimate defense and try to play the ball, or you're just trying to trade 3-for-2 at the end of a game. 2) After any foul deemed to be intentional in the final two minutes of a game, run five seconds off the clock before any free throws are shot - sort of like the 10-second run-off in the NFL. This would eliminate some of the utility of the endgame fouling strategy while still preserving some possibility of comebacks in certain circumstances. I do like those ideas. Particularly how with #1, you eliminate the enormous time-drag of the setup and execution of foul shots. On Tuesday, the Board of Governors voted to adjust the current rule which states that if an intentional foul is committed in the last two minutes of a game, the fouled team is awarded one free throw and possession of the ball. With the rule change, the final two-minute rule will apply to the final two minutes of every quarter. It's not limited to away-from-the-ball penalties. The rule is on the books, they'd just have to enforce it with the common-sense interpretation of what an "intentional foul" is in these situations. I like the idea of enforcing intentional fouls except for the fact that it gives the referees a lot of discretion for controlling the end of the game. And given the league's history with Tim Donaghy, I'm not sure that you want that outcome. They call an intentional foul if you foul away from the ball. I like that: it forces teams to work to try and keep the ball out of the hands of the best FT shooter. In general, I'm pretty OK with the current rules for the last two minutes. It is off the ball only. There is still no on the ball, non flagrant, intentional foul rule I can find. What if, in conjunction with my two above suggestions, you broadened the definition of "intentional foul" to include all backcourt fouls? (Or perhaps just all backcourt fouls in the final two minutes of the game?) That would take the element of discretion out of the equation, and also give the trailing team at the end of games several options, assuming my #1 idea is in effect: a) play hard defense in the other end of the court, without trying to foul; b) wait for the other team to get across half-court, and then foul, hoping they miss their free throws; c) foul in the backcourt, and give two points away automatically, but get the ball back immediately. Of course, option a) might turn into option c) if a foul is committed, but them's the breaks. Back in the day, all backcourt fouls were two-shot fouls, IIRC. This is an interesting timeline. • Players limited to two fouls per quarter and if a third foul is committed; the player has to sit out the remainder of that quarter. The rule is rescinded when it fails to prevent late game fouling. I actually like this a lot (subject to minor tweaking), and I'm not even someone who thinks the last 2 minutes need much improvement. That backcourt dynamic would add a lot of excitement/skill/strategy, and NBA players are pretty good at trapping without fouling (plus the officials would probably give some leeway in that spot).